Fern and Feather: feeling crafty in NYC? Moomah Cafe. This has got to be the most 'up my alley' place on Earth. 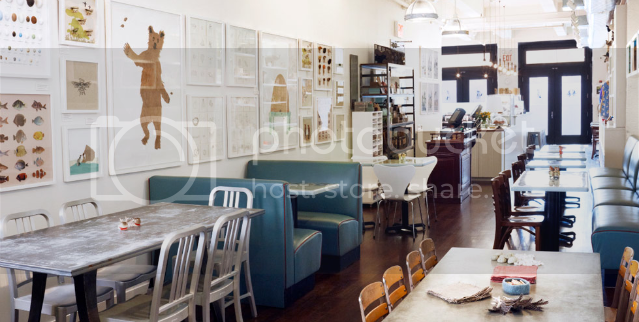 Healthy, delicious food, wonderful design ~ decor, and ART, lots of ART. This is a place to go to get a smoothie and be creative with your kids or just with yourself. I think they need to franchise. no? Wow, I love everything about this place too! The metal table, blue booth and wood pieces. Oh, and those black french doors and artwork too. LOVE IT! A perfect mix of modern and vintage.